Artificial light is a necessary feature for home kitchens. In this space, you work with sharp tools and depend on your eyes to chop, read labels, inspect food and clean up afterward. With so much importance placed on kitchen lighting design, you have to be practical. However, this shouldn’t limit you from making a bold statement in your kitchen. Each kitchen is different, therefore, you have to ensure your lighting design is optimal for what you have. Because each kitchen is different, making sure you focus on the focal point of your kitchen can help guide your lighting design. These areas include a kitchen island, kitchen table, dining room table or a cooking space. You simply want to focus on whichever area is the most important. If you don’t have room for a table or kitchen island, your cooking area would be the biggest focal point. However, if you have an island and a small kitchen table, you might want to focus on the island, where you prep and prepare food, instead of your small kitchen table. Down-Light Pendants – For direct light, you want to use a down-light pendant. This fixture is perfect for illuminating task areas. 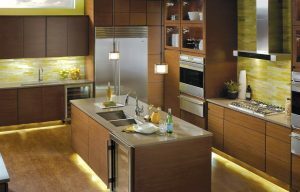 If you want your centerpiece fixture to go over a kitchen island or cooking space, you will want a down-light fixture to easily see while prepping and cooking food. Up-Light Pendants – For a more general illumination that won’t feel like a spotlight, you want to go with an up-light pendant. These fixtures are ideal for kitchen or dining tables where you need some ambient light, but not directional light. Also, down-light fixtures can be unflattering to your guests while sitting at the table. Additionally, there are numerous spherical or chandelier lighting fixtures that can also be used in a kitchen. These types of lights tend to provide ambient light as well. Whichever fixture you choose, make sure it’s practical before it becomes the centerpiece of your kitchen. Visit your local Hortons showroom or go online to hortonshome.com to learn more about kitchen lighting options.